Mega Sale! Free Shipping Included! 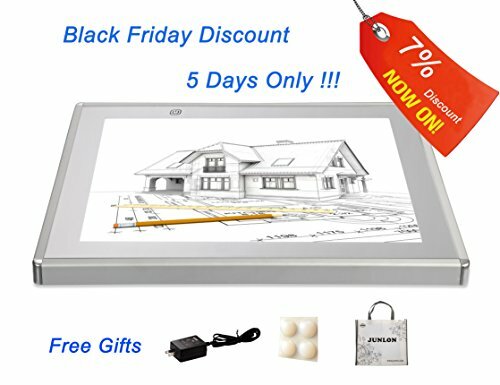 Save 28% on the JUNLON A2 Aluminum LED Light Board Pad Great Variety Tracing Box Table for Drawing Light Tracer Artists Tattoo Stencil Artcraft Tracing Animation Extremely Bright Adjustable Brightness by 17x24” by JUNLON at Stickman's Blog. MPN: COMINU055281. Hurry! Limited time offer. Offer valid only while supplies last. All our products are with one year warranty, and can return within 30days. All our products are with one year warranty, and can return within 30days. *JUNLON Light pad is high quality, ultra slim, heat free LightPad,acrylic surface makes it feel like a glass panel. *Aluminum frame, round corner, strong and long life. *It's a sleek light-up pad, the light from the pad through the paper clearly illuminates the images, which make tracing images become easy. *Extremely thin,it is convenient to take for you,it can follow with you in anywhere. *With power supply, convenient to use in wall plug directly. *Touching on/off, adjustable brightness,so you can set it to to your preference. The illumination is perfectly even, super bright, and flicker-free. *Eyesight Protected,the LED cold light source will protect your eyes carefully. Providing the most comfortable lighting environment for animators, designers, art enthusiasts. *You can copy the artwork easier and can also put the pad on table when light, then kids can put different things on it with light to train their appreciation of the beauty. *It is perfect for multiple domains, such as Sketching, Drawing, 2D Animation,Tattoo Outlines, X-ray viewing etc . *Color box packing, good look and protected. BE AWARE: JUNLON is the real manufacturer, and the ony authorized seller of JUNLON light pad. Forbid any selling following. Light pad manufacturer exporting to US from Year 2007. Adjustable brightness from 1100 to 5300lux. Eye-protected LED, no flicker. Aluminum frame, study and professional, 0.67in thickness and 10.3lb in weight. A2 (17*24") lighting area. Great for: Scrapbooking, viewing slides & photo negatives, tattoo design, calligraphy, quilting, weeding vinyl, drawing ect. If you have any questions about this product by JUNLON, contact us by completing and submitting the form below. If you are looking for a specif part number, please include it with your message.